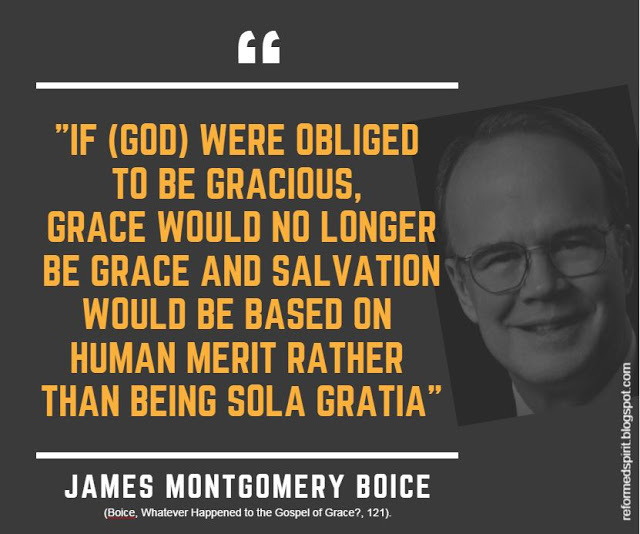 Salvation is by grace alone. The Scriptures are quite clear on this matter. We cannot work, earn, buy, merit, deserve, or win salvation for ourselves. This grace has been given to us in the form of a covenant, the New Covenant made with the Blood of Christ. Ephesians 2:8For by grace you have been saved through faith, and that not of yourselves; it is the gift of God, 9not of works, lest anyone should boast. 10For we are His workmanship, created in Christ Jesus for good works, which God prepared beforehand that we should walk in them. Hebrews 8:7 For if that first covenant had been faultless, then no place would have been sought for a second. 8Because finding fault with them, He says: “Behold, the days are coming, says the LORD, when I will make a new covenant with the house of Israel and with the house of Judah– 9not according to the covenant that I made with their fathers in the day when I took them by the hand to lead them out of the land of Egypt; because they did not continue in My covenant, and I disregarded them, says the LORD. 10For this is the covenant that I will make with the house of Israel after those days, says the LORD: I will put My laws in their mind and write them on their hearts; and I will be their God, and they shall be My people. 11None of them shall teach his neighbor, and none his brother, saying, “Know the LORD,’ for all shall know Me, from the least of them to the greatest of them. 12For I will be merciful to their unrighteousness, and their sins and their lawless deeds I will remember no more.” 13In that He says, “A new covenant,” He has made the first obsolete. Now what is becoming obsolete and growing old is ready to vanish away. It was of free grace that God had any thoughts or designs of rescuing mankind after the fall. If there had not been an immense fountain of goodness in God, he would never have entertained any thoughts at all of ever redeeming us after our defection. Man was happy enough at first, and might have continued so to all eternity, if he would; he was not compelled to fall. If he had not willfully and sinfully rebelled against God, he would never have been driven forth like an unworthy wretch, as he was. But although God had been so overflowing in his bounty to him as to make him head over the lower creation and ruler of all other creatures, and had planted a garden on purpose for his delight, and would have fixed him in an eternal happiness only on the reasonable condition of his obeying the easy commands of his maker; but yet notwithstanding all, he rebelled and turned over, from God to the devil, out of a wicked ambition of being a god himself not content in that happy state that he was in as man and so rebelled against God’s authority. Now who but God of boundless grace, would not have been provoked, after this, to leave him as he was, in the miserable state into which he had brought himself by his disobedience; resolving to help him no more, leaving him to himself and to the punishment he had deserved, leaving him in the devil’s hands where he had thrown himself, not being contented in the arms of his Creator; who, but one of boundless grace, would ever have entertained any thoughts of finding out a way for his recovery? God had no manner of need of us, or of our praises. He has enough in himself for himself, and neither needs nor desires any additions of happiness, and if he did need the worship of his creatures, he had thousands and ten thousands of angels, and if he had not enough, he could create more; or, he could have glorified his justice in man’s eternal destruction and ruin, and have with infinite ease created other beings, more perfect and glorious than man, eternally to sing his praises.